Prior to Feb. 2, the stock market had been through a remarkably tranquil period. Since that date, the U.S. stock market has experienced multiple days with drops of 2 percent or more in a short period of time. Here, though, we will focus on the long-term investing concepts you should keep in mind, as well as historical context for market moves of this magnitude. Markets are notoriously difficult to forecast over any horizon, and this difficulty is only amplified over shorter periods of time. Nevertheless, this won’t stop some market “professionals” from trying. You would be wise to ignore these forecasts in your own decision-making. Yes, markets are currently extremely volatile, but that volatility might not continue and no one can reliably know whether stocks will move up or down from here. In fact, no one can even clearly know what caused the drop over the last week. Some commentary we have seen points to inflationary concerns while other pundits blame anxiety around the U.S. budgetary process. Still others believe the market is concerned the Federal Reserve may raise interest rates too quickly. Who’s to say which, if any, of those explanations are correct, much less what that implies going forward. What we do know, though, is that over the long term, you can expect to be rewarded for investing in a low-cost, diversified portfolio of stock funds. The recent past shows us just how wrong consensus, short-term forecasts can be. Two recent examples are the post-financial-crisis prediction of higher interest rates and the expectation that the stock market would decline following the 2016 presidential election. Both predictions were clearly wrong, and investors who acted on them instead of focusing on the long-run evidence that markets tend to reward risk-taking were harmed. One of the advantages investors have today compared to investors in the early part of the 20th century is that we now have decades-worth of data to help us understand long-run returns and risks. Our partner, BAM Advisor Services, maintains an extensive database of the risk profiles associated with the portfolios that we recommend to clients. This data allows us to incorporate risk into the way we build your financial plan, meaning that outcomes like the market falling by 2, 3 or 4 percent over a handful of days already are reflected in our recommendation. The BAM Advisor Services Investment Policy Committee is well aware that these events — however unpredictable — will eventually happen, and we therefore imbed this knowledge in the comprehensive planning process that results in your portfolio allocation. 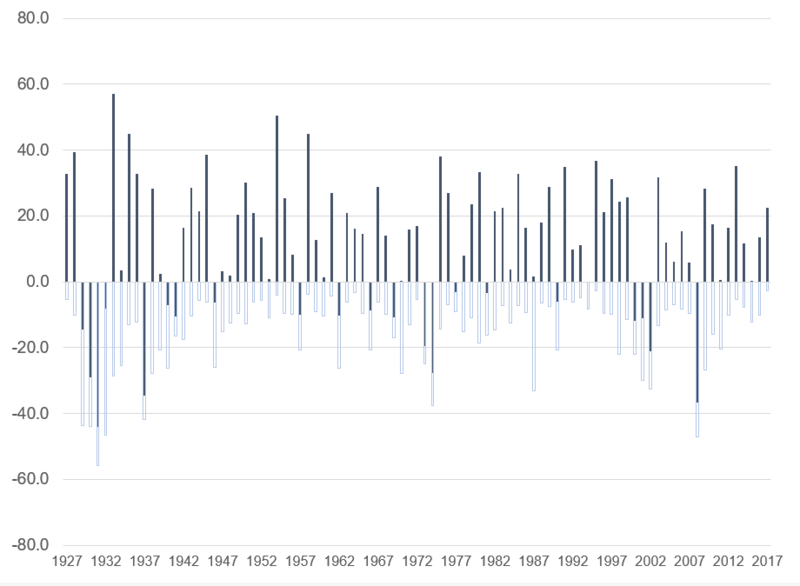 The following graph plots the historical annual return of the U.S. stock market in each year (in blue) from 1926 through 2017 and the largest intra-year decline (in light blue outline) that occurred in each of those years. There are two primary takeaways from this graph. First, as we all know, the stock market goes up far more often than it goes down. Second, but possibly less well known, virtually every year includes a period of time where markets fell precipitously. It’s clear, though, that these intra-year declines don’t necessarily signal whether the market will be up or down over that particular year. But it does show that stock markets have and always will be risky, particularly over shorter periods of time. Are There Any Actions to Take? Given what we know, we obviously don’t recommend making drastic changes to your portfolio allocation as a result of short-term market moves already accounted for in the planning process. Your portfolio is well-thought-through and built to be highly diversified. But are there any other actions worth considering? If you haven’t recently, now could be a good time to reassess your investment plan from a long-term point of view. We’re always here to help with that endeavor.